If you don’t like gin it’s probably because you are drinking the wrong one. So pull up a tray of ice cubes, slice yourself a lime and prepare to have your taste buds expanded. Real gin, good gin, is one of life’s simple pleasures; it’s year round summer in a glass. And it’s what we’re passionate about. The sweetened juniper heavy jenever created by the Dutch in the 17th Century has little in common with the clean, clear-scented spirit we now call gin. The modern incarnation of this drink owes its existence to an Irishman, Aeneas Coffey. He patented a column still capable of producing a very pure spirit which didn’t need sweetening, thus the moniker ‘dry’. Gin is enjoying a renaissance thanks to craft distillers like ours. The British took gin to their heart while carving out their colonies. They used it to mask the bitter flavour of quinine, a tonic taken to fight malaria. So the G&T was born; liquid sunshine for the soul. Gin was the drink of the roaring 20’s and the key ingredient in just about every jazz age cocktail from the Martini to the Singapore Sling. Now gin is enjoying a renaissance thanks to craft distillers like ours and other small operations around the world. SO WHAT’S SO SPECIAL ABOUT OUR GIN? When designing our gin, we didn’t (as many do) look into the local hedgerows. Instead we took ourselves off to the local archives and dug into the Blackwater Valley’s rich and largely overlooked Anglo-Irish past. In the Victorian period, White’s of Waterford was one of the largest importers of spices in the Kingdom. They also ran a ship yard and their vessels criss-crossed the globe importing tea from China and botanicals from the impossibly romantic ‘Spice Islands’. These botanicals were landed in Waterford and sent by steamer up the Blackwater River. They were landed at the pier in Cappoquin, barely a kilometre from the distillery, from which the precious goods were dispatched to the great houses in the valley. In the dusty archives we found a treasure trove of botanicals once popular, but now overlooked. We distilled each and every one of these spices; some weren’t so great but two were spectacular and they lie at the heart of Blackwater No.5 Gin. 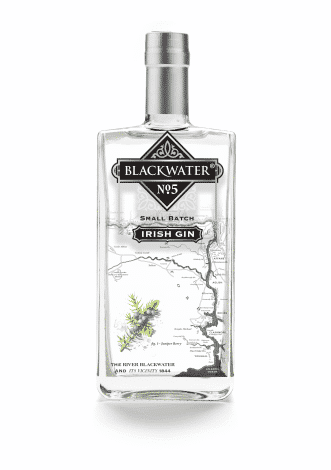 And that’s why an 1844 map of the Blackwater River can be seen on each and every bottle of our gin.